They could do a job in Tralee. 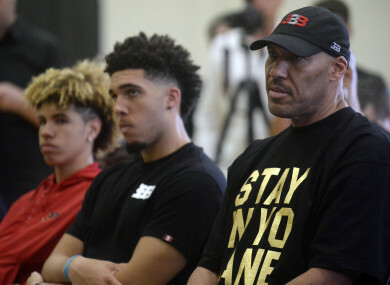 LIANGELO BALL AND LaMelo Ball, the two youngest sons of LaVar Ball and youngest brother of the Los Angeles Lakers rookie Lonzo Ball, have signed one-year contracts with Lithuanian basketball team Prienu Vytautas. ESPN’s Adrian Wojnarowski and Jonathan Givony first reported that the LiAngelo and LaMelo were in talks with the team. LiAngelo Ball, 19, was recently pulled out of UCLA by his father after being indefinitely suspended following his arrest on a charge of shoplifting in China. LaMelo Ball, 16, had a scholarship offer from UCLA, but had major eligibility questions because of his shoe line with his family’s Big Baller Brand clothing company. According to ESPN, the club hopes the Ball brothers and LaVar could provide a marketing boon for the team. When LaVar announced he was pulling LiAngelo from UCLA, he said it would be to prepare him for the NBA Draft. However, several reports said NBA teams didn’t even consider LiAngelo a prospect. ESPN’s Jeff Borzello reported earlier in December that LiAngelo’s arrest in China and LaMelo’s eligibility questions began fracture the standing relationship between the Balls and UCLA. While LaMelo is regarded as a better prospect than LiAngelo, without playing in college, he would have to wait a year to enter the NBA Draft or play overseas. Email “LiAngelo and LaMelo Ball are reportedly signing possibly underwhelming contracts for a Lithuanian basketball team”. Feedback on “LiAngelo and LaMelo Ball are reportedly signing possibly underwhelming contracts for a Lithuanian basketball team”.